The global marine mining market was valued at around US$ 500 Mn in 2017 and is anticipated to expand at a CAGR of more than 34% from 2018 to 2026, according to a new research report titled ‘Marine Mining Market – Global Industry Analysis, Size, Share, Growth, Trends, and Forecast, 2018–2026,’ published by Transparency Market Research (TMR) . Marine mining is the process of retrieving mineral deposits from the sea and the area of the ocean below 200 meters. More than 1.5 million square kilometers of the international seabed has been set aside for mineral exploration in the Pacific and Indian Oceans and the Mid-Atlantic Ridge. Interest in the deep sea mineral deposits has been rising constantly due to the depleting terrestrial deposits for metals (such as copper, nickel, aluminum, manganese, zinc, lithium, and cobalt) and increase in demand for these metals in the production of smartphones and green technologies (such as wind turbines, solar panels, and electric storage batteries). Additionally, growth in automobile manufacturing and the aftermarket industry in the U.S., Germany, and Japan is anticipated to boost the demand for industrial metals such as platinum, copper, and nickel. Thus, rise in population and depletion of terrestrial deposits are expected to drive the exploitation of rich oceanographic mineral reserves. In terms of technology, the remotely operated vehicles (ROVs) segment dominated the global marine mining market in 2017. ROVs are unoccupied, highly maneuverable underwater robots operated by someone at the surface of the water. They are also known as underwater drones, specifically designed and developed to make underwater observation easy and affordable. ROVs are used in various applications. Most of these are used for scientific purposes. They have proven to be extremely valuable in ocean exploration. Therefore, this segment is anticipated to expand at faster pace than any other segment during the forecast period. The Offshore Minerals Act 1994 establishes a regulatory regime for the exploration and production of minerals in Commonwealth waters that adheres to the principals of the 1979 Offshore Constitutional Settlement. Under the Act, exploration and recovery of resources found within the coastal waters of a state are administered by the state. Responsibility for minerals operations in Australia’s offshore areas beyond three nautical miles from the coastal baseline rests with the Australian Federal Government and is governed by the Commonwealth. Based on application, the automotive segment dominated the global marine mining market in 2017. In terms of value, the segment accounted for more than 30% share of the market in 2017. Various types of minerals such as iron, copper, magnetite, and hematite are used in the automotive industry. Electric vehicles require two to three times more amount of copper vis-à-vis traditional vehicles. Copper is employed in car batteries, permanent magnets for motors and wiring, various inverters, and electrical distribution infrastructure. This is positively affecting the marine mining market. The automotive segment is estimated to expand at a rapid pace during the forecast period. Asia Pacific led the global marine mining market in 2017. Papua New Guinea was a major country of the marine mining market in Asia Pacific in 2017. The country constituted more than 50% share of the market in the region in 2017. The Solwara 1 project in Papua New Guinea is the first in the world to be granted rights for deep sea mining, whereby enormous machines would dig into the ocean floor, harvesting zinc, copper, gold, and other commodities essential for building electrical equipment. The global marine mining market is highly attractive. Large numbers of local and international players operate in the market. 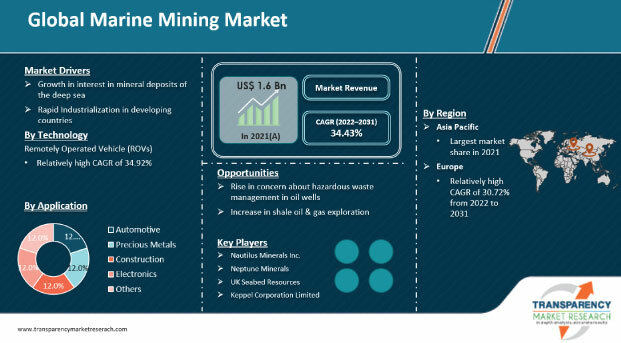 Key players operating in the global market are Nautilus Minerals Inc., Neptune Minerals, UK Seabed Resources, Keppel Corporation Limited, Soil Machine Dynamics Ltd, Royal IHC, Ocean Minerals, LLC, Diamond Fields Resources Inc., DeepGreen Metals Inc., and China Minmetals Corporation.